Continuing with my series on Golden Retriever obedience training, we now take a look at how to train a Golden Retriever to lie down and stay. In the last article we concentrated on training your Golden Retriever to sit, describing how it’s a very good way to start your training. The down command is the next natural step being very easy for both you as the trainer to teach, and for your dog to understand and do well with. Remember, we want to set our dogs up to win when training, we want to start gently with the very basics to build their confidence. Teaching the down command is one such way to do this. The down command is an incredibly useful tool providing a way to manage and control your Golden when necessary and will serve you both well throughout your life together. In this article I teach two highly effective yet simple to follow techniques you can use to train your Golden to get into a down position: Luring and capturing. I also briefly discuss why you shouldn’t use physical coercion to train the down command. Follow along and I can promise you will find success in no time…and have fun along the way. 1 What Makes The Down Command So Useful? When Can It Be Used? What Makes The Down Command So Useful? When Can It Be Used? There are many situations in every day life when you can use obedience commands and the down is possibly the most useful. It’s an excellent way to control your dog and keep them in check. Massive safety benefits to nail them to the spot if a dangerous situation is forming. For instance if your dog is on the other side of a road, about to cross and a car is coming you can command a down until safe and then call or go to get them. It’s more reliable than a sit to stop an impulsive dog. For instance if your Golden is the type to chase a motorbike or squirrel, when in a sit they can explosively bolt in an instant. But they are calmer in a down, less poised for action and so it takes more to go from a down to a run, giving you greater opportunity to interrupt and correct them. A down is more relaxed than a sit and dogs will find it easier to hold a down for far longer than a sit. So if you need your dog to stay in one spot for any length of time, the down is the perfect command to use when you need them to stay put. Because a down is such a relaxed position, it’s very useful to calm an over-excited dog. 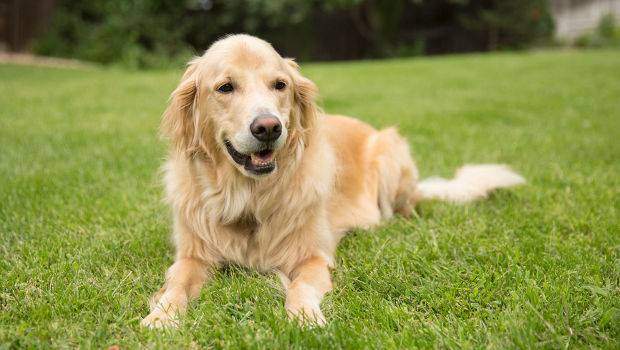 If your Golden is getting too boisterous around children or other dogs, ask for a down and it will calm them and take the edge off their boisterous energy. Basically, the down position is overall calming. But more than anything, a dog in a down cannot run off, jump up on people, chase another animal or dart into traffic. A dog that’s laying down is a dog that cannot get into trouble. For the first few sessions when the down command is new to your dog, hold the training at home in a familiar room with no distractions to make it easy as possible for them to succeed. Because a dog’s hearing is so more sensitive than our own, speak your commands in a quiet, warm but firm tone of voice. Sound friendly yet authoritative, not frightening. For the best results, train the down command after your Golden has enjoyed some exercise and before their dinner. If they’re full of energy it will be harder to relax and lie down, and if they’re hungry they will be more willing to work for the tasty treat rewards. You should train a release command. ‘Down’ should mean lie down and stay until I say you can get up, not just lie down and get up when you want to. So train a release command, otherwise there’s no way for your Golden to know they’re done and can get up again. You can use ‘OK‘, or ‘Up now!’ as a release. ‘Down’ and ‘go to bed’ or ‘go to your crate’ are different commands. Please use different commands for each behavior, otherwise it can cause confusion, make them harder to learn and be less effective. Always be upbeat and happy when training, keeping it fun. And finish before your puppy gets bored so they enjoy the experience and look forward to your training sessions together. Just 5 or so minutes, 2 or 3 times per day is plenty for a puppy and you can increase the number of sessions and duration as they grow. Luckily for us, our dogs already know how to lie down and this makes our task so much easier. We only have to make them do so on command. Our aim is to train our Golden Retriever to lie down completely when we ask, with their belly touching the floor and their front legs stretched ahead of them. No bum in the air, not merely crouched, but all the way down, belly to the floor. And then they should wait for us to release them. As with all training there are many techniques and methods you could use. In this article I will concentrate on the two most simple which are both kind, positive and highly effective: Luring and capturing. Start with your dog in front of you, facing each other. Hold a treat firmly in your hand, right in front of your puppy’s nose so they can smell it but cannot get it. Slowly bring your hand straight down to the ground and your puppy’s nose will follow it, with their head, neck, shoulders and whole body dropping slowly to the floor. Now slide your hand along the floor away from your puppy so it’s in front of them and between their paws. The whole movement of the lure is straight down, and then away from them, in an L-shape not a diagonal. It’s down, then away. To follow the treat your puppy will have to lower themself and they should drop into a down position. Say the command ‘Down!’ as they begin to drop. As soon as your Goldens front elbows are down on the ground, say ‘Good down!’ and give them the treat. TIP: If starting from a standing position, some dogs will simply walk forward to follow the treat along the ground instead of getting into a down. If this happens, get them into a sit first so their bum is already on the floor, then lure them into a down. We don’t want to bend down to the floor ourselves every time to ask for a down, we want to stay standing. So we want to progress to training a hand signal to use from a standing position. After a few training sessions where you have the treat in your hand, lure them into the down position with an empty hand, using exactly the same motion, but with no treat. As soon as your puppy is in the down position, say ‘Good down!’ and get them a treat from your pouch or pocket. Still treat them, just not from your luring hand. Progressing very slowly so your puppy still knows what you’re asking, begin to make the luring movement but do not get all the way down to the floor. Go down to an inch above for 2 training sessions. 2 inches above for 2 more sessions, 3 inches above for the next 2 sessions and so on. Make sure you keep using the ‘down’ command as you go to keep the association strong. In time you will be able to use the signal while completely standing, not having to bend down at all. Eventually you want to morph the movement into extending your arm straight, palm facing down, and lower it from a horizontal position towards the ground while saying ‘down’. This is the internationally recognized hand signal for a down. One of the easiest ways to train a behavior is to wait for your Golden to offer it anyway, then reward them for it. All dogs will lie down at some point eventually, all you have to do is be there and watching to capture it. First of all, take your dog out for some exercise to tire them out a little. Then shut yourself and your dog in a quiet room where there’s no distractions and nothing to do. Remove all toys and anything of interest to encourage boredom and for your dog to lie down. With nothing exciting happening and nothing else to do, eventually your dog will lie down. As soon as they do, mark the behavior (click or say ‘good down’) and throw them a treat. You throw it so that they have to get up, so they’re in the correct position to offer the down behavior again. Your dog is now likely to offer different behaviors, attempting to get another reward. Just ignore them completely until they offer a down again. As soon as they do, mark the behavior again and throw another treat. Play this game for a while, until they’ve given a down 5 to 10 times, and repeat this for 4 or more sessions over a couple of days. It won’t take long for them catch on and start offering the down regularly to get the reward. When they are offering the down regularly, you can start adding a cue. When they begin to drop, say ‘Down!’ and reward them once their elbows and bum are on the floor. For those of you that read my article on training the sit command, you’ll remember I wrote how you can physically put them into a sit. This isn’t something I’m going to recommend or write about for the down command. Physical coercion for a sit is both easy to do and very gentle if done as described. But forcing a dog into a down is not. There are some right and wrong ways to do this, but if you’re unskilled it’s very easy to get wrong and you can harm a puppy’s growing joints. So I advise you to use the two methods I’ve already described. I promise you will succeed with these methods plus a little patience and dedication. There’s no need for physical coercion. At first, use the command when your dog is already rising for a few training sessions, capturing them getting up. Then start to train the down command and when they start to rise, interrupt them and put them back into the down position. Then release them with the ‘OK!‘ command. If they ignore the release word, you can easily lure them up with a treat. This will almost never fail. Try to go for longer and longer durations of a down before you release them as your training progresses. More on this a little later. As discussed in previous articles, you simply must phase out the food rewards and cannot treat them every time forever. You don’t want to have to carry food around with you at all times, and a treat loses its effectiveness if given every time anyway. As the first stage of phasing out food rewards, start to ask for more before you give a treat. Only treat the best downs. Then ask for a combination of behaviors before treating (sit, down, sit then treat), and eventually treat just at random times, sometimes for a sequence of 3 behaviors and sometimes for 6. You should praise them for the correct behavior, just don’t give food treats every time. Once you’ve done this a few times, you want to start changing the reward they’re offered. It doesn’t always have to be food. You can ask for a sequence of behaviors and give them a favorite toy, game of tug or literally anything your puppy likes. Your end goal is to make rewards truly random. Sometimes food, but often something else. Sometimes for one behavior, sometimes for a sequence of 6. Not knowing what’s coming or when it’s coming takes advantage of the gambling effect and will keep your dog keen to follow your commands without giving food every time. To make any new command or behavior reliably trained and useful, you have to proof and generalize it. Proof it by adding distance, duration and distractions, and generalize it by practicing the command in many different types of environment. The general rule is that you add one at a time of either duration, distance or distractions, otherwise it will be too hard and your dog may begin to fail. So start by asking for a down and not treating and releasing for 3 seconds, then 4, then 5…all the way up to asking for 20 seconds+. Once there, increase the duration by 5 seconds each session until you get to 5 minutes, then increase by 30 seconds, eventually working up to half an hour and beyond. Of course, asking for a 30 minute down isn’t the basis of a dedicated complete training session! You would do this while sat watching TV or other times you yourself are sat calmly. And it will take months of slow progression to work up to this level. Don’t try to rush it. After adding duration, you can start trying to add distance to the command. To do so, ask for a down and take a step away before releasing. Then two steps, three steps and so on. Over many, many training sessions (weeks / months), your aim is to be able to walk quite far away with the down still being held. For generalizing, practice all the above at home, in friends houses, down the park, in town, anywhere you can think of. If your dog starts to fail and breaks the down, it’s likely you’ve progressed too fast and should take a few steps back, make the task easier before progressing once again. The idea is that by increasing either distance, duration or distractions one at a time and in different situations, you slowly increase the difficulty and soon enough you will be able to have your dog reliably lie down and stay until you release them, in any real life situation. This won’t be easy, does take time, work and patience, but the result is worth it. 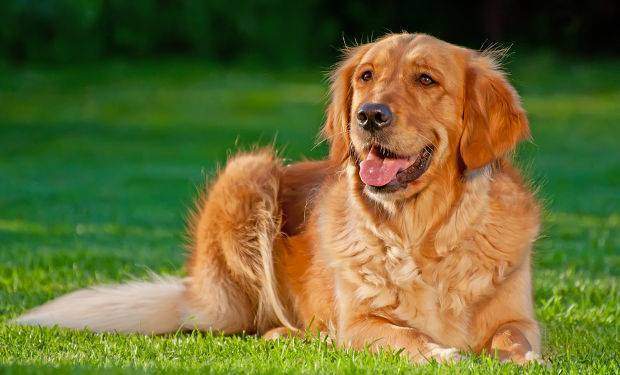 Once properly trained, the down command is possibly the most useful of commands that offers you a lot of control to keep your Golden out of trouble and keep them safe when you need to. A dog in a down is a dog that cannot bolt, chase, jump up or get into trouble of any kind. You should train the down command as soon as you start obedience training, right after your Golden has learnt to sit. It’s easy, fun and an essential ingredient of any dog training program. To achieve a well-mannered and obedient dog, you simply must be able to put them into a down until released, no matter the environment and distractions nearby. By applying the techniques described in this article, with patience and dedication you will accomplish this in no time. Next: What Do A Dogs Barks Mean?